For years, I’ve been buying oven mitts at the local supermarket. However, they wore out easily and I had to buy new ones soon. That’s what I did for years, but recently I got a nasty burn on my finger after a mitt ripped while taking a pizza out of the﻿ oven. Because of that I decided that I needed something better. Why Are Good Oven Mitts So Important? What To Look For In A Good Oven Mitt? As anyone who ever dabbled in cooking can tell you, getting burned is a constant danger. It could be a hot stove, a heated plate straight from the microwave or some spilled soup, it doesn’t matter. For a cook, hands and fingers are your most important instruments and keeping them safe is a priority. That’s where oven mitts come in. Made of materials resistant to heat that sometimes extend past your wrist to cover your entire forearm and protect you from getting burned. Something a wet towel can’t really do, as I found out early in my life. Getting a particularly bad burn or ruining a perfectly good dish because you dropped it is just not worth the money you save by using a towel. Sometimes also called heat resistant oven gloves, they are incredibly important instruments in the kitchen – not only for keeping yourself safe, but for a few other uses as well. 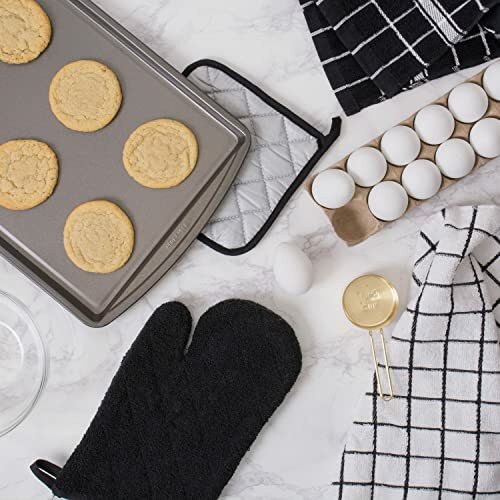 The obvious use you can get out of oven mitts is handling hot things in the kitchen – whether it be a ﻿﻿hot pa﻿﻿n, pot, plate or tray, or stirring some food, it works pretty well and protects you from the heat. In the kitchen, you can also use a long oven mitt as a coaster to put hot plates or pots on, protecting more delicate surfaces from getting damaged, like a good wooden table for example. However, you can use them outside of the kitchen as well. When you’re grilling some meat in the yard or even on a camping trip, they can come in handy to protect your hands from the flame and heat as you’re flipping those burgers. They can also be helpful in any other situation where you really need to protect your hands from the heat. Maybe when you’re fixing something in the garage or replacing a light bulb – but for that, you might want to use oven gloves with fingers. Not all oven mitts are created equal – some are clearly better than others. However, you might not be able to notice that at first glance. I sure couldn’t, and it cost me dearly. Of course, this is the first things you should consider – if they don’t protect you from the heat, what use are they? They should be able to resist some pretty significant heat to do that. The best heat resistant gloves can protect you from the heat of around 400 to 450 degrees, tops. That is usually written on the packaging, and you should check for it. Some commercial oven mitts you can buy in supermarkets don’t really measure up and can only withstand temperatures of around 300 degrees or less, so you should be wary. If you don’t look out, you might get burned – both figuratively and literally. What oven mitts are made from is the reason they can withstand so much heat. They aren’t just made from some flimsy cloth and plastic – there’s much more under the surface. Cheaper oven gloves are mostly made from cotton. However, take it up a notch, and we come to the gloves that contain materials like Teflon, which are very heat resistant and thus protect you better. There are other materials used in oven gloves; silicone is a common one. They are coated in it, which makes them resistant to water and other liquids. This is very important, as a wet oven mitt actually conducts heat better than a dry one, making it less protective. If you tend to spill things, you want this. The most expensive models use even stronger materials, like Kevlar or Nomex. Some people even prefer just to make their own, custom oven mitts, to ensure they’re well protected, and that’s a valid choice. It might seem like this is unimportant, but depending on what you use your oven mitts for, it can be crucial. 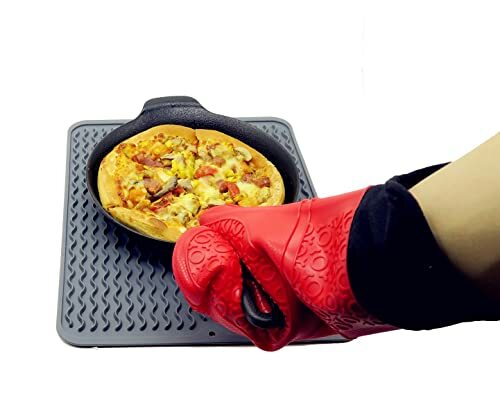 Oven mitts should fit comfortably on your hands - not too loose since you don’t want them slipping off and not too tight since you don’t want them restricting your movement. For example - when you’re cooking with the wrist like while stir-frying, you might want to use some slightly looser mitts in order to have freedom of movement. After some searching for an ideal oven mitt for me, I ended up buying and testing quite a few products before finding the right one. In order to help you, here’s a short selection of the ones I tested. This is a pair of silicone cooking gloves that come in a variety of different colors. They offer pretty good protection and are resistant to heat of up to 450 degrees. This helped me a lot when grilling. Their design includes pads on the palm area, which helps them stick better to whatever you’re holding, minimizing the risk of slippage. I found that very helpful around the kitchen. However, the problem with their design is that they cover a very small area, barely reaching below your wrists. That’s not a lot of protection, but it’s usually enough. More problems with the design include the touted “one size fits most” feature – which is not entirely true. I can use them without issue; my kids, however, can barely hold anything with them. On the other hand, my husband, with his large hands, can’t even put them on properly. Even I find them a bit too bulky. Due to their silicone coating they are resistant to water and oil, so they don’t really need to be washed and are great for holding a steaming pot that’s usually pretty wet on all sides. You can even hold wet or oily hot food directly with them. This is another pair of silicone oven mitts coming in a few different colors and one size. They also provide pretty high heat resistance. Up to 482 degrees, in fact, which covers pretty much anything I could do in the kitchen and beyond. Owing to the silicone, these mitts are also waterproof which comes in handy if you’re prone to spilling things. The grooves on the silicone also offer good grip, even on wet surfaces. The design is great, as far as protection goes – they cover not only your hands but most of your forearms as well, almost reaching to my elbow. They feel comfy on the inside to boot; the fabric is very soft and pleasing. However, they are just too big and bulky and difficult to use for most tasks. They are very hard and barely bend, making them too cumbersome in the kitchen. That’s good for grill roasting or maybe stoking your fireplace in the winter, but nothing else. In addition to that, I can barely wear them without them slipping off, and it’s not like I have minuscule hands. The asking price is pretty affordable though, for people who can actually put these mitts to some use. This is a pair of mitts with a silicone coating, coming in five different colors and two different sizes – 13.7 or 14.7 inches long. For posterity, I bought and used the 13.7-inch gloves. Like all silicone gloves, these too are resistant to water and are easily washable – either by hand or with a dishwasher. Either way, works fine and doesn’t damage them. You can also just clean them with a damp cloth if they get a little dirty. The heat resistance they boast is rather high, around 450 degrees, which covers most uses I would have for them. As far as the design goes…there are a few problems. The good thing is that they cover your hand and most of the forearm. However, everything else is the problem. The cotton lining on the inside is strange and really loose. My hand just kept moving around the mitt while I wore it like it was immersed in Jell-O - very strange. It doesn’t help that the mitts are huge for the average hand, and simply do not fit. They are also massive and bulky and just awkward to use in general. They are rather cheap, though, if that helps. 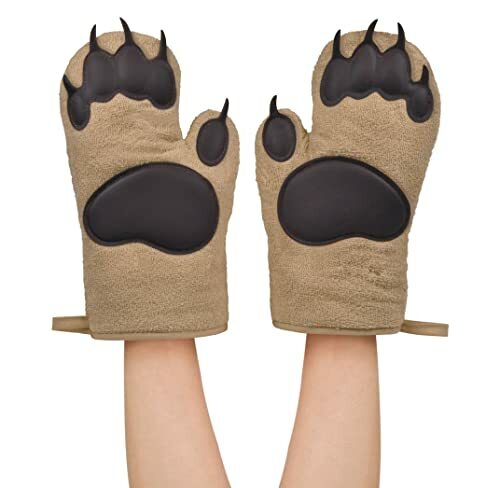 This is a peculiar pair of oven mitts. They are mostly made from insulated cotton and have a bit of silicone padding on the outside, making them a bit of a hybrid. But that’s not the strangest part of the design. It’s that they are shaped like bear paws! Which I kind of like to be honest, they just look rather fun. However, this proves to be a bit of a problem – the silicone pads are more resistant to heat than the rest of the mitts. Because of that, when handling anything that’s a bit hotter than average, these mitts are not very useful. Still, I find that they work pretty well in most situations. The inside of the mitts is also strange, as the area for the fingers is rather spacious, while the thumb area is quite small, making it pretty hard to grip anything. Bending the thumb proves to be almost impossible, so I just used them like there’s no thumb. They are also not very durable, sadly, and a few threads came loose over the course of a month and a couple of machine washes, leading me being concerned. They are affordable, but not sure if they are worth it. Here we have a set of two cotton oven mitts, pretty standard. They come in one size of 7x13 inches, and multiple colors. Their design includes a loop that’s used for hanging them. These mitts do not boast a specific heat resistance, and it’s rather obvious why. They are not very protective, and you can barely hold on to even milder stuff with them. The material they are made off also singes and melts easily on the edges – releasing a horrible smell. They claim to be 100% cotton, but that doesn’t seem believable. Very flimsy too as they started falling apart after only two or three washes in the washing machine – and I followed all relevant instructions. Don’t know what happened there, to be honest. They feel rather comfortable on the inside, though the lining is as flimsy as the outside and prone to ripping easily, which may lead to burns. Take care. Furthermore, they barely cover your hands and wrists, having no protection whatsoever for the forearms, and are not waterproof in the slightest. Meaning that one spill could easily ruin them and endanger your arm. On the upside… they are very cheap, and pretty much anyone could afford them. 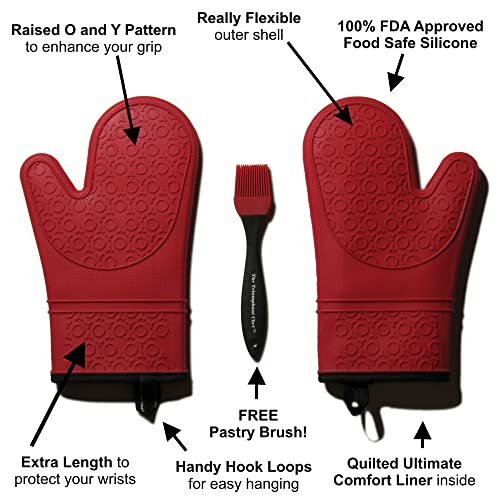 Well, for me, this was really a no-brainer - T﻿﻿h﻿﻿e Triumphant Chef ﻿﻿Silicone﻿﻿ Oven Mitts offer the best value for the price. They have their downsides, but I haven’t found better mitts so far. Compared to the other silicone gloves here, they are far less cumbersome and more flexible while still offering some very good heat protection, and all the other features of silicone gloves, like water resistance. Moreover, compared to cotton or hybrid mitts, it’s really a no contest, and they are easily better than them in all areas. Of course, in the future, I might yet find some better oven mitts, but these are the ones I use on a daily basis now, and I hope to do so for years to come. If I find any better ones, I’ll be sure to write about it. Happy cooking! I have yet to find a silicone mitt that holds up over time. Invariably, the lining wears away until my fingers are in contact with the silicone from the inside, and that provides 0 heat protection. How long have you been using/testing these mitts? I’m tempted to resort to the old cheap silver, coated, mitts that I can just replace once or twice a year if I need to. I had the same experience like you, Brenda. 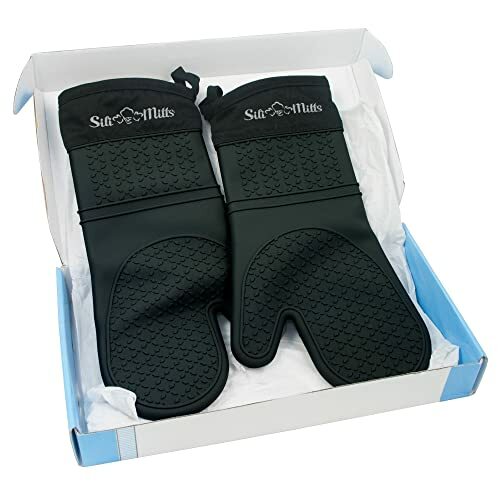 But for now (around 2 months if I’m not wrong) the heat protection from T﻿﻿h﻿﻿e Triumphant Chef ﻿﻿Silicone﻿﻿ Oven Mitts is great. I’m really satisfied with them.